Are Weed & Feed Lawn Care Products Too Toxic to Use? Companies specializing in chemical lawn-care products have long offered combination products that contain both fertilizers to feed the lawn and herbicides to kill crabgrass or broadleaf weeds. There are often marketed as time-saving products that allow a homeowner to accomplish both feeding and weed control in one action. Examples of these products include a variety of Scotts' Weed & Feed Turfbuilder formulations, BioAdvanced's Weed & Feed Fertilizer and Crabgrass Killer, Greenview's Weed & Feed, Preen's Weed Preventer and Plant Food, and Knox Weed/Feed. Weed & Feed is a combination of fertilizer and broadleaf herbicide that is usually applied to lawn mid-season as a way to knock down weeds and feed the grass in one easy application. The fertilizer ratio can vary, but most popular brands usually feature a high nitrogen water-soluble fertilizer that encourages top growth The vast majority of these products are in a granular form that is applied over the lawn with a broadcast spreader or drop spreader. Independent lawn experts see problems with weed & feed products on several fronts. First, the high nitrogen content stimulates top growth, but it does nothing to the overall health and vigor of the grass plants. All lawn fertilizers are somewhat nitrogen-heavy, since deep green foliage is the goal, but a better fertilizer choice is one that is somewhat more balanced, offering at least some phosphorus to help the grass plants store and use nutrients, and some potassium to assist with root development. The typical application time for weed & feed products, generally mid-summer, is also not necessarily the best time to jolt your lawn with heavy feeding. Spring and early summer are much better times for major fertilizer application to a lawn. The excess nitrogen found in weed & feed products can indeed leave you with an enviable, dark green lawn, but that grass will be extremely susceptible to drought. And excess nitrogen can lead to grub infestations and disease conditions. But it is with the weed-control aspect of weed & feed products that the real trouble starts. The herbicide used is a powdered form of popular broadleaf herbicides that contain 2,4-D, mecoprop, and dicamba. This combination of chemicals is popular because it performs a lethal action on broadleaf weeds while leaving lawn grass unharmed. These products work by sticking onto the surface of the weeds, so conditions must be exactly right for the product to work. The lawn should be wet to allow the herbicide dust to stick to the leaves, but it is also important that rain is not forecasted; you don't want to wash the product off the leaf before it has done its job. These precise optimal conditions can make proper application of weed & feed quite difficult, which often leads to misuse. Combination products containing fertilizer and herbicide have been officially banned in Canada since 2010. Many provinces already had some legislation restricting the use of weed & feed or cosmetic herbicides, but the decision by Health Canada brought a total ban on the sale and use of the once-popular combination product. The legislation concerning using weed & feed in Canada side-steps the most controversial aspects of using chemical herbicides—mainly the health concerns of long-term, repeated exposures—and goes for a more agronomic approach. Instead of entering the health controversy, the Canadian decision focused on the inefficiency of these products. First, applying herbicide as a blanket application is not necessary. Weed & feed products spread herbicide to the far reaches of the lawn, whether there are weeds or not. Practices like this are out of touch with integrated pest management (IPM) and other, more sensible approaches to lawn care. Using herbicide where none is needed is excessive and not environmentally sound. Another problem with combining the two products is that fertilizing the lawn and killing weeds on the lawn are best viewed as two separate events that should not be combined. Fertilizing the lawn should be done following your chosen lawn care regimen while eliminating weeds is its own practice and can be done more safely and more efficiently by spot spraying throughout the season. ...they take into their bodies more of the pesticides that are in the food, water and air. [Their] delicate developmental processes are easily disrupted by very small doses of toxic chemicals that would be virtually harmless for an adult. If you must use chemical herbicides on a lawn, a far more responsible approach is to spot-treat weeds. Use a liquid spray product to coat the leaves of individual weeds when you spot them—doing this immediately after lawn-mowing chores is a good regimen. And don't discount the old-fashioned means of weed control—digging them out by hand. Especially in a small lawn, hand-removal of weeds is not a difficult chore, especially if you do it routinely so that major weed infestations cannot take root. A variety of helpful tools are available for lawn weed removal, ranging from long-handled forks to weed "poppers" that can remove the entire root. Weeding by hand also has the benefit of naturally aerating your lawn as you remove cores containing weed roots. In some areas, any cosmetic use of herbicides—not just weed & feed—has been outlawed, and even spot-spraying weeds is not a viable alternative. A simple IPM program can help, along with a proper lawn care regimen. In any case, a strong argument could be made for looking into organic lawn care. Organic weed control takes a more holistic approach to weeds and sees their presence as a sign of other underlying problems. Many weeds invade when grass is stressed or thin/bare turf is present. An aggressive over-seeding program can help, as well as mowing the lawn at heights of 3 inches or more. 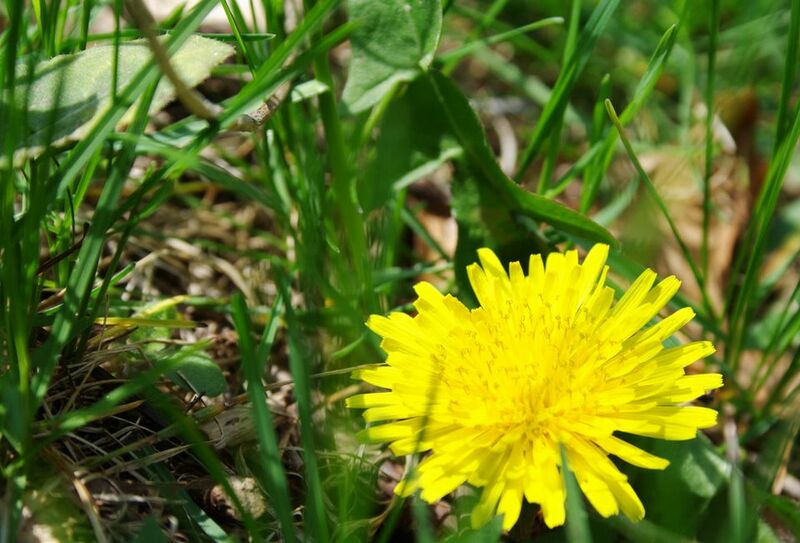 Some weeds—dandelions for example—tend to favor soils low in calcium, so a soil test and subsequent calcium applications may be a way to reduce their numbers. Ultimately, providing the optimum conditions for growing grass is the best way to control weeds.